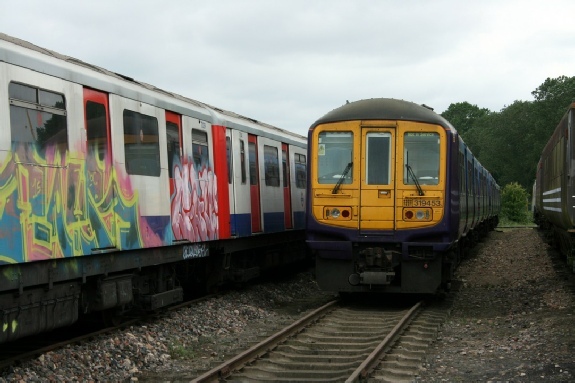 I applied for some tickets for Rail Live held at Long Marston airfield where ther are several stored railway rolling stock. Travelling from Paddington on a GWR Turbo in lieu of an HST which was operating the service for Glastonbury festival to Castle Cary. Departure was on time but time was lost to Oxford where the rear unit was detached. Leaving Oxford we were further delayed getting onto the Single line arriving at honeybourne some 20 mins late. A train shuttle service was provided by prior booking. Access to the Branch was by a small section of fencing which had been removed and the train front door aligned to the gap. 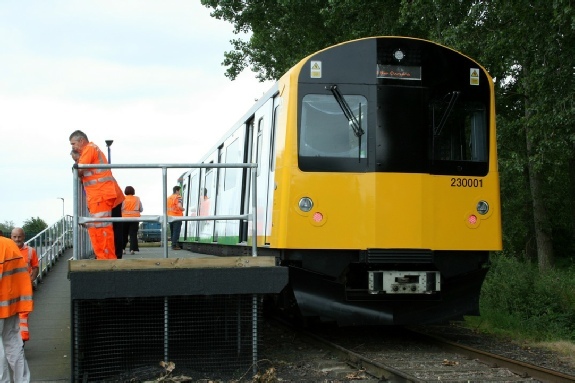 Vivarail supplied unit 230 001 which was formed of 3 vehicles of ex LUL D stock vehicles. On board were the representatives of Viva Rail who were available to answer questions about the unit. The middle coach was fitted with a disabled toilet and various seating arrangements to try out. On arrival at Long Marston a temporary Station had bee erected for the shuttle service. It was then a short walk to the show ground. The exhibits were situated on ground around the siding areas. Most of the exhibits were engineering based . A stone blower was exhibiting in one siding. It certainly had power. On another siding was a single car D stock vehicle being tested for battery operation . In the various sidings were redundant class 86/6 locomotives, Cl 319 units , two Eurostar power cars and trams plus many more rail vehicles. A walk back to the shuttle was made and a chat with the crew revealed that the unit was about to go main line testing soon. The problems encountered between Leamington and Coventry had been resolved Another smooth ride on a well presented train which uses a lot of the old fittings and with new makes the train a very interesting concept it is reported that LNWR are going to use them between Bedford and Bletchley in the near future. I wish Viva rail good luck. 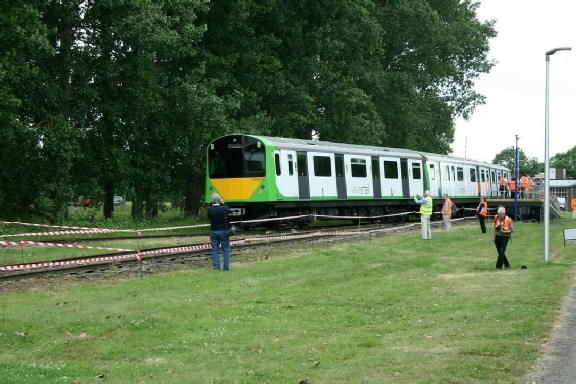 230 001 leaving the temporary station at Long Marston. Driver motor 300 001 leads. 230 001 at the platform at Long Marston. Note the different front end paint scheme at the two ends of the unit. Also note that the original LUL Wedgelock coupling is still fitted. It’s a long way from the District Line! D78 Driver Motor (DM) 7031. 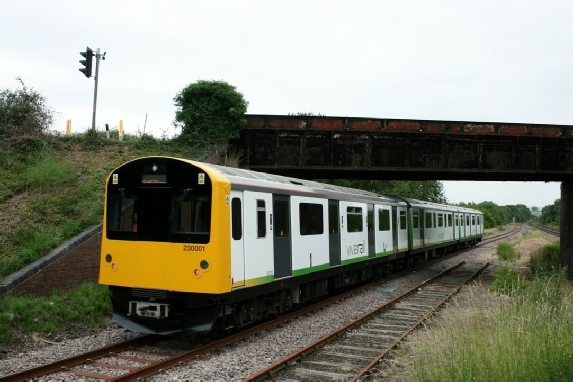 Some 157 DMs and 70 trailers have been purchased by Vivarail for possible conversion to heavy rail use. And away from Bedford. 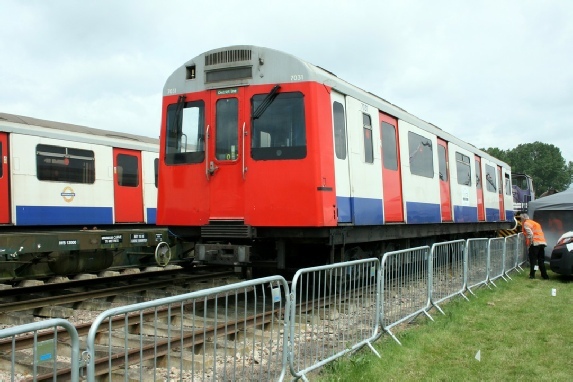 Class 319/4 319 453 awaits possible reuse. This is one of 45 319 currently off lease of 86 319s originally built. D Stock DMs 7039 & 7041 on the left and former Virgin Mk3a coaches on the right. 230 001 on the move, with DM 300 101 leading.